Why Don't Vultures Get Sick When Eating Dead Things? 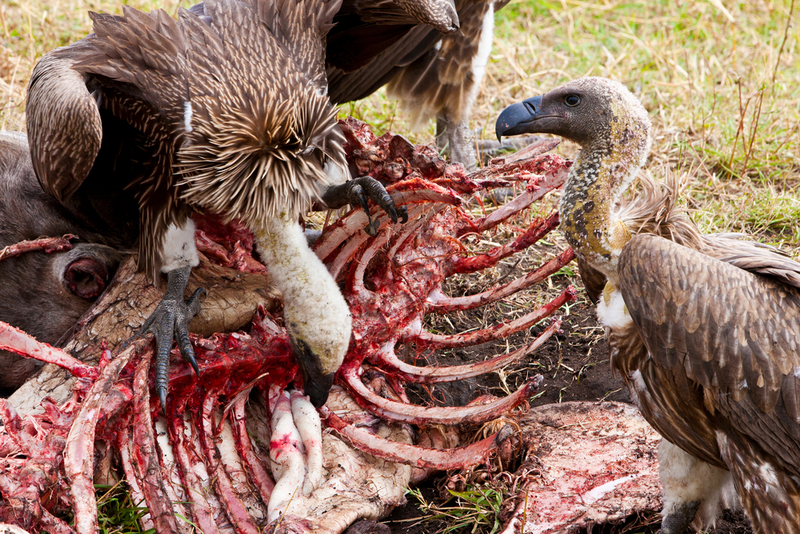 Scott K. asks: Why don’t vultures get sick when eating dead things? How come humans can’t do the same? While it’s important to note that many animals eat carrion, vultures are fairly unique in that they’re able to eat carrion that has succumbed to the effects of decay and disease, a feat few stomachs in the animal kingdom can match. As an idea of just how ridiculously hardy vultures are, experiments have shown that they are all but immune to botulism and that they can happily chow down on the flesh of an animal coated in Bacillus anthracis which is better known as the bacteria that causes anthrax! They also have no problem eating an animal infected with rabies, hog cholera and numerous other diseases that would ultimately be lethal to most other scavengers. In other words, in the extreme a turkey vulture’s stomach acid could technically be almost 1000 times more acidic than yours at a given instance. In fact, it’s so acidic that it can dissolve many metals. For further reference, battery acid has a pH of about 0.8. As for why humans don’t have the same abilities, vultures spend almost all of their eating time in close proximity to decaying, disease filled flesh, so it’s only understandable that members of their ancestry who could handle these sorts of things better would over time dominate the species’ gene pool and be able to eat progressively more decayed flesh without consequence- evolution in action. Humans, on the other hand, didn’t typically subject themselves to such things. Although humans can eat raw meat provided it’s very fresh, and our gastric acid is strong enough to kill many types of bacteria (though not the kind that causes ulcers, for instance), our stomachs just aren’t equipped to deal with intentionally imbibing certain types of bacteria. In the end, humans spent many thousands of years using our brains to develop ways to avoid dead, uncooked flesh, while vultures by necessity have spent thousands of years conditioning themselves to thrive on it. Of course, there is a point at which even a vulture will say no and flesh will be deemed too putrid or foul to eat. However, this doesn’t necessarily stop the vulture from eventually eating some of the remains. For example, the bearded vulture can live on a diet of 70%-90% bone. In fact, according to studies conducted on bearded vultures, this diet is actually more efficient than a diet of fresh meat because bones have a higher caloric content and the bones will last indefinitely, unlike flesh. So long after the flesh has gone, the remaining bones are still fair game for the bearded vulture. Perhaps the most surprising fact about vultures is that despite their near-universal reputation as disease carrying pests, they are considered by experts to be the exact opposite and it’s observed that when vulture populations decline in an area, the rate of disease will usually go up, sometimes dramatically. Why? As we’ve already covered, vultures’ digestive systems kill off most bacteria present in carrion making them “dead-end hosts“. So if a vulture eats a diseased animal, the spread of the disease ends there because it will likely be neutralised by the vulture’s body. This, combined with the vulture’s propensity for picking carcasses completely clean, means that in areas lousy with vultures, the risk of disease spreading from dead bodies is relatively low. However, when a vulture population is displaced, the rate of disease will climb as the bodies of animals are inevitably left to rot and are consumed by, not dead-end hosts, but potential carriers. Further, vultures notably urinate and defecate all over themselves while they eat which, thanks to the highly acidic nature of their bodily waste, kills any bacteria that makes its way onto the vulture’s legs. This also has the side effect of sterilising the area around the carcass, also stopping disease from spreading. To illustrate what can happen without the vultures in some areas, in India, a massive decline in vulture populations (such as 80 million white-rumped vultures in the 1980s vs. only a few thousand now) led to an explosion in the population of feral dogs (estimated to be about 18 million today in India) and rats with whom the vultures formerly competed for carcasses. These animals, unlike the “dead-end” vultures, are vectors for numerous diseases including rabies. The remains of the carcasses that were formerly picked clean by the vultures are also now contaminating water supplies causing further disease issues. This is more of a problem in India than it would be in many other nations as only about 4% of their 500 million or so cattle are eaten by humans when they die, with the rest in the past primarily being eaten by vultures. This has become such a widespread issue that significant research was done to determine why the vultures were dropping dead. In the end, it was determined by Dr. Lindsay Oaks et al in 2003 that it was the anti-inflammatory drug diclofenac that was highly toxic to vultures. This drug was commonly given to livestock (around 10% of the livestock in India), the carcasses of which the vultures would eventually eat. Given the tens of thousands of extra human lives lost per year in India due to the vulture population decline, diclogenac was banned in India in 2006 with a substitute being developed called meloxicam that is not toxic to the vultures. In a study conducted by the Forensic Anthropology Research Facility in Texas to see how quickly vultures could skeletonize a human corpse, a wake of 30 vultures reduced a body to nothing but bones in less than five hours. It’s believed that vultures have bald heads so that they can push their head right inside of a carcass without getting dead flesh stuck to themselves. This also has the benefit of helping the vultures with heat regulation. Poachers have been known to target vultures to help conceal their crimes as vultures are often used as a tool by conservationists to find the carcasses of poached animals. When a predator approaches a vulture, the vulture will often vomit, with the contents of its stomach potentially distracting the predator, while simultaneously lightening the vulture so it can fly more easily. Contrary to what you may often read, however, the vulture does not projectile vomit at potential predators in an attempt to use its highly acidic stomach acid as a defense mechanism. I love vultures, my 2nd favourite animal. In Tibet, a very mountainous and rocky terrain makes it difficult to bury people who have passed on. Some locales make the corpses available to vultures, in a ritualistic way, for an alternative disposal. I’ve read about this in an old book so don’t know if this is still a current practice . pH does not go from zero to fourteen: this is a common misconception. pH is an open scale, defined as -Log₁₀[H₃O⁺]. If you have a 10 mol/L solution of HCl, your pH will be -Log₁₀ = -1. (HCl is a strong acid that dissociates completely.) Similarly, very low concentrations of H₃O⁺ are possible: a saturated solution of NaOH has a pH of 15.0. People just assume that because 7 is neutral that the scale goes from 0 to 14. There are some fundamental physical thresholds at which you’ve used up every molecule of water, but they’re not at 0 and 14.